A resident Hungarian orchestra was maintained, and outside there was also a private circus, a skittle alley, and a skating rink to entertain the guests, who included King Edward VII and the Shah of Persia, among many theatrical celebrities of the day. [ii] During the First World War, the estate became an Army training centre, and, on the death of Alfred de Rothschild in 1919, it was bought for the newly formed Royal Air Force as the home of training for the aircraft apprentice scheme. It then became the Officers’ Mess, and continues as that today. 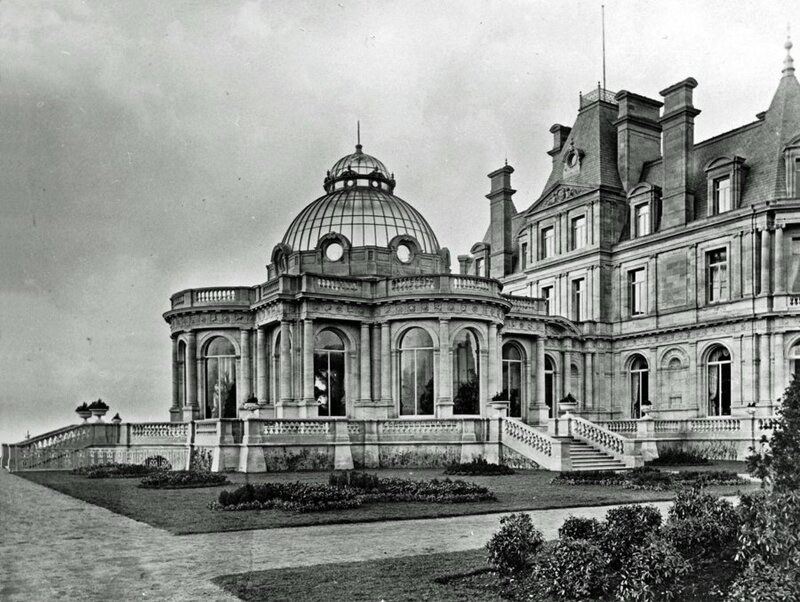 Halton House was built between 1880-83, at around the same time that James 2 was working on the Tulip Patch caves at Waddesdon. 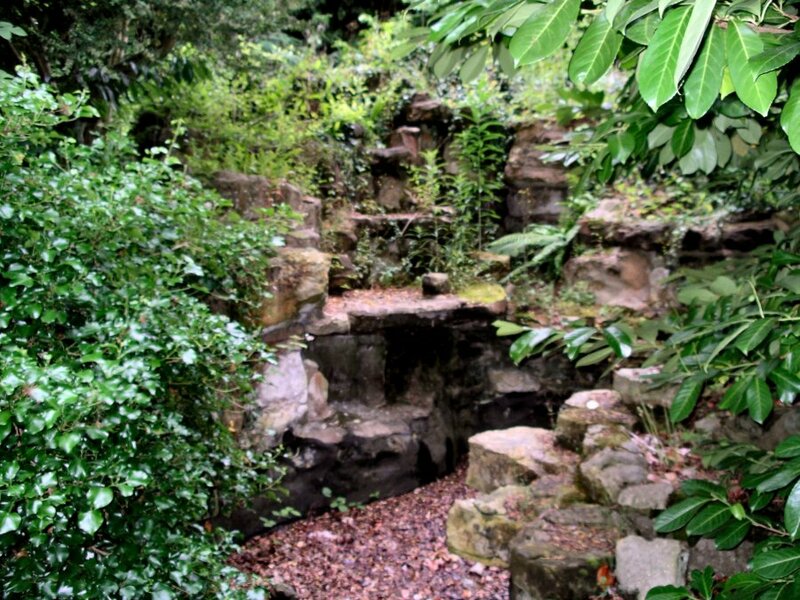 The firm also worked for Alfred’s father, Lionel, at Gunnersbury Park in 1874, and it is consequently not stretching the imagination very far to conclude that they would be among the first contractors to be considered whenever the family wanted to construct ornamental garden features elsewhere. 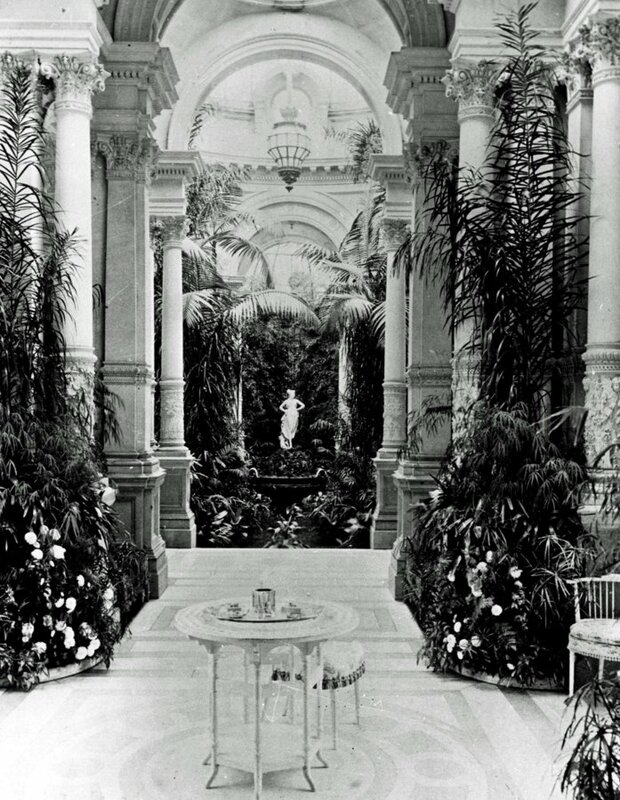 The ‘large domed conservatory known as the winter garden’ was attached to the house, but was demolished in 1936 because it was no longer safe after many years of neglect. It was replaced by the West Wing single officers’ accommodation, and the Halton House website carries some interesting pictures that show how it looked in its heyday. [iii] Fig 1 shows the exterior, which carries all the signs of the Pulhams’ involvement. Its quatrefoil shape is one that was often used in the design of their fountain basins, and it has a balustraded terrace and steps, together with a collection of vases – it is not possible to identify which ones they are from this description, but they certainly look ‘right’. Fig 2 shows the interior of the winter garden, and, here again, this looks quite similar to others they created elsewhere. In fact, it is really taking the firm back to its roots, as can be seen if one refers back to the work they did at Kilnwick Percy, near Pocklington, Yorkshire, in 1848 (‘Rock Landscapes’, Fig 2.16), and at the Victoria and Albert Museum in London in 1867-68 (‘Rock Landscapes’ Fig 3.23). 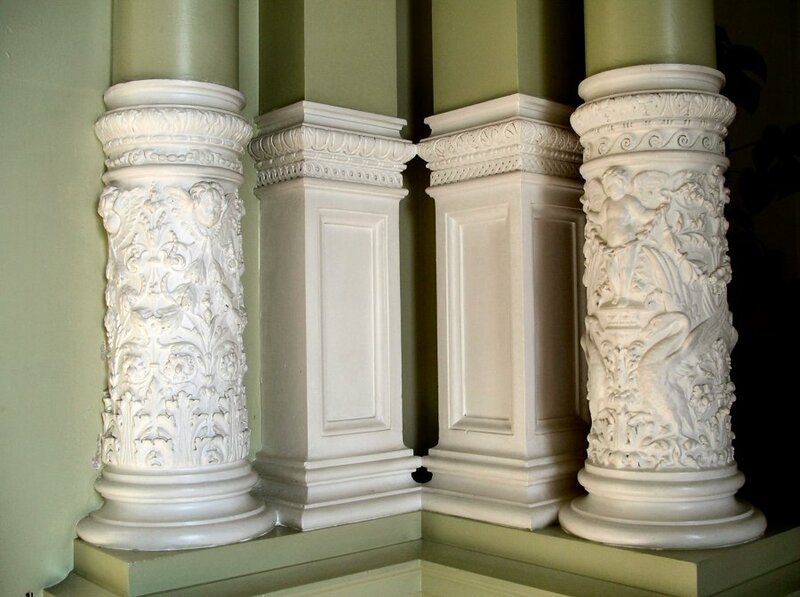 The entrance lobby to the Winter Garden still remains, and four of its original pillars are pictured in Fig 3. The statue at the centre of the room (Fig 2) is also interesting. It is a copy of the ‘Dancing Girl’, after the statue by Canova, reference to which has already been made in the notes about the Summerhouse at Dunorlan Park, in Tunbridge Wells – discussed in Rock Landscapes’ Chapter 5 According to my references, that copy was created by William Theed in 1885, although it did not arrive at Dunorlan Park until 1951, when it replaced the original statue of the ‘Lady of the Lake’. Could this be the same statue? 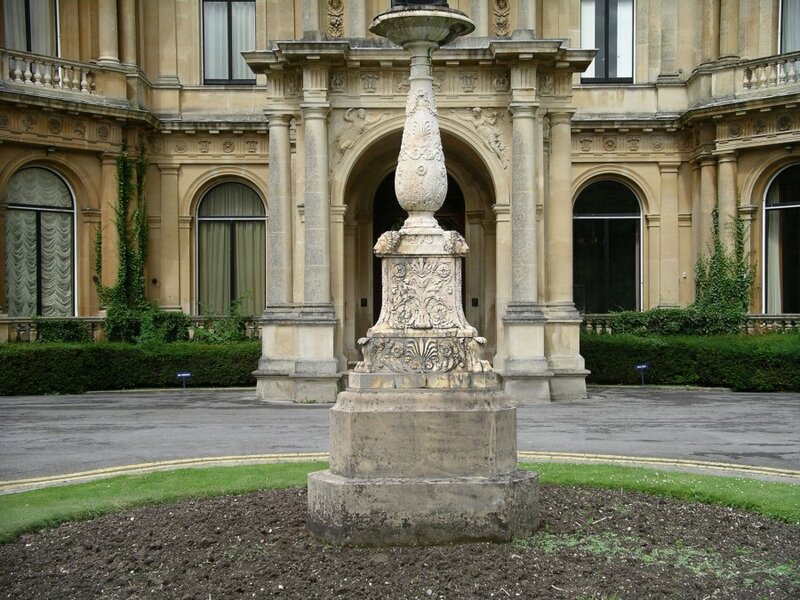 The date of 1885 would be just right, so maybe it was removed from Halton House when the winter garden was demolished in 1936, and held in store somewhere until 1951, when it was installed at Dunorlan – unfortunately, only to be stolen in 2006. Something else catches the eye as one approaches the entrance of Halton House. It is shown here in Fig 4, and looks as if it could originally have been part of a fountain. The ‘business part’ at the top has now gone, but it seems far too ornate to have been made purely for erection in the middle of a ‘flower bed’. 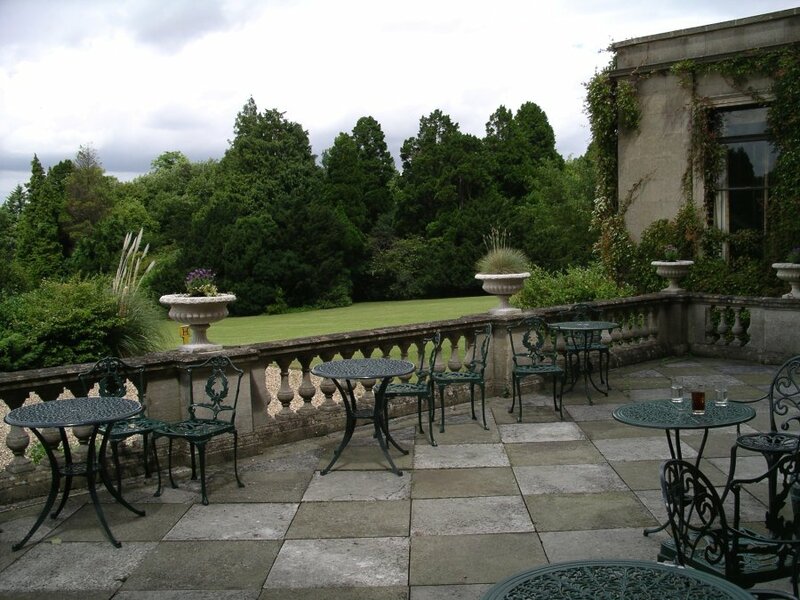 The terrace along the back of the house also remains – Fig 5 – together with some vases that are presumably copies of the originals. Posted on April 30, 2015 June 4, 2016 by Claude HitchingPosted in Sites Month 2Tagged 'Dancing Girl' - Canova, . . James Pulham and Son, Alfred de Rothschild, Baron Lionel de Rothschild, dunorlan park, Gunnersbury Park, Halton House - Aylesbury, waddesdon manor, Winter Garden.